An easy crochet granny scarf uk format for you to crochet, I have made it in a double knitting yarn on a 5.50mm crochet hook, you will be surprised how quickly it works up. Hope you enjoy it. Check out my Granny Square pattern. Row 2 – 3ch, miss 2tr, 3tr into the first space between 2tr and 3tr group, * miss 3tr, 3tr into space between next two 3tr groups, * rpt from * to * to last tr and 3ch to turn with, miss tr, 1tr into top of 3ch. Turn. Row 3 – 3ch, 1tr into the base of 3ch, * miss 3tr, 3tr into the space between next two 3tr groups, rpt from * to * to last 3tr and 3ch to turn with, miss 3tr, work 2tr in top of 3ch. Turn. Rpt Rows 2 & 3 three more times. Turn. 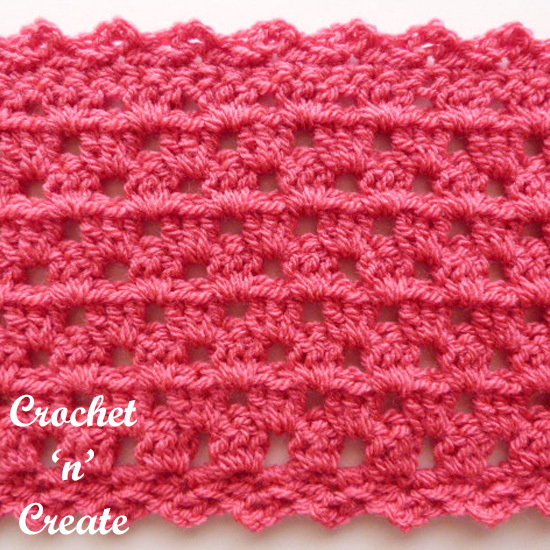 (you should have nine rows worked in all) See Granny Stitch Tutorial. Border – 1ch, 1dc into base of 1ch, 1dc into each tr to end, 3dc into top of 3ch, work 17dc evenly into row ends down first short side of scarf, 3dc into corner, 1dc into each ch along starting chain edge, 3dc into corner, work 17dc evenly into row ends up second short side of scarf, 1dc into corner, ss to first dc on beginning of row. Turn. Picot Row – 1ch, (1dc, 2ch, 1dc) into base of 1ch, * miss 2dc, (1dc, 2ch, 1dc) into next dc, * rpt from * to * around all sides of scarf to end, working (1dc, 2ch, 1dc, 2ch, 1dc) into corners, ss to first dc on beginning row. Fasten off. Don’t forget to pin it folks. The written instructions and pictures for this free crochet granny scarf uk pattern are copyrighted to crochet ‘n’ create © 2018. 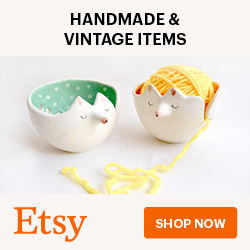 You are welcome to sell the finished products made from the free crochet granny scarf uk pattern, I just ask that you please use your own pictures and put a link back to crochet ‘n’ create. 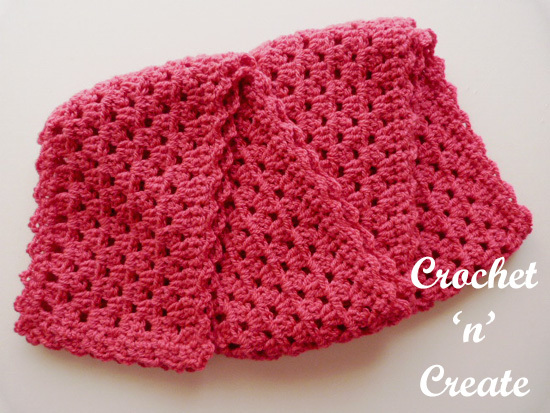 DO NOT share the written instructions for this crochet granny scarf uk pattern. 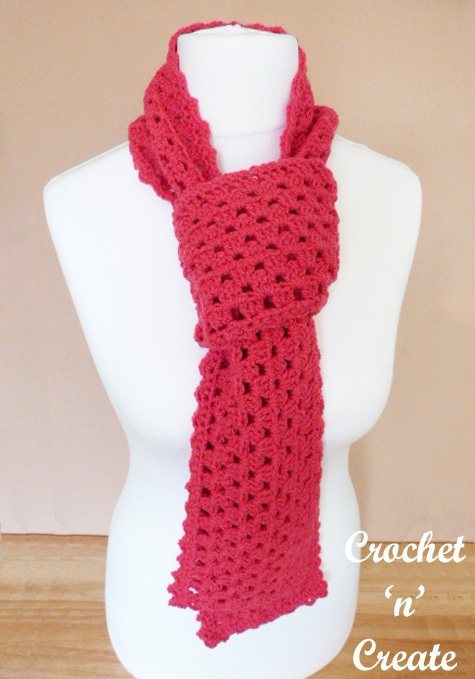 This entry was posted in crochet scarves and tagged crochet, crochet ladieswear, crochet scarf, free crochet patterns on 9th January 2018 by crochetncreate.